Mobile service providers will find the next decade to be full of new challenges and opportunities. Meanwhile, the mobile internet phenomena has offered a welcomed increase in service revenue, but there were also some unanticipated negative side effects. 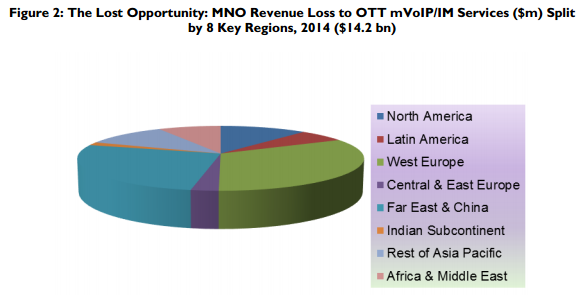 Juniper Research claims that voice and messaging traffic lost to Over-the-Top (OTT) mobile internet application providers -- such as WhatsApp, Facebook and Skype -- will cost mobile network operators $14 billion in lost revenues globally this year, that's up by 26 percent since 2013. Their worldwide market study found that in a number of European markets -- including Italy, Spain and the UK -- operator mobile voice revenues had fallen to less than 60 percent of their value five years ago. Juniper analysts argue that a combination of instant messaging (IM), Voice over IP (VoIP) and social media substitution was primarily responsible, resulting not only in lost revenues but in additional costs due to the scale of signalling traffic. However, according to the Juniper assessment, there's an array of new product or service opportunities with the potential to deliver cumulative revenues to mobile service providers in excess of $66 billion over the next five years. Juniper believes that the resulting upside revenue potential from these new offerings could more than offset the ongoing decline of core service revenues on an annual basis by 2018. "In areas such as M2M (Machine to Machine) and mobile money, mobile operators can achieve a substantial revenue uplift by focusing on full service provision rather than simple connectivity," said Dr. Windsor Holden, Head of Consultancy and Forecasting at Juniper Research. Additionally, Juniper recommends that mobile network operators implement direct carrier billing to retain a foothold in the lucrative mobile content space, and enhance their big data analytics capabilities to monetize consumer insights that can be gleaned by studying their subscriber's historical transaction data. Without optimization, mobile data delivery costs will increase by more than three times over the next three years. Implementation of NFV (Network Function Virtualization) solutions offer operators the potential of both cost savings gained by reducing their dependency on legacy proprietary hardware, and by accelerating their new go-to-market activities. Mobile network operators can also boost core revenues by introducing higher-value shared data plans or by bundling content into a monthly subscription fees.